Founded in 1800, the Library of Congress is the nation’s oldest federal cultural institution. The Library provides Congress, the federal government and the American people with a rich, diverse and enduring source of knowledge to inform, inspire and engage them and support their intellectual and creative endeavors. The Library of Congress is the largest library in the world, with more than 162 million items on approximately 838 miles of bookshelves. The collections include more than 38 million books and other print materials, 3.6 million recordings, 14 million photographs, 5.5 million maps, 7.1 million pieces of sheet music and 70 million manuscripts. David Rubenstein is a major supporter of the Library of Congress literacy initiatives, including both the popular National Book Festival, which attracts hundreds of thousands of booklovers each year, and also the Library of Congress literacy awards, which recognize organizations working to alleviate illiteracy in the United States and worldwide. Mr. Rubenstein has also made it possible for the Library to display the historic Abel Buell map of America, the first map of the newly independent United States that was compiled, printed and published in America. Mr. Rubenstein serves as chairman of the James Madison Council, a private-sector advisory group to the Library, and has been a member of the Council since 2005. Launched in 1990, the Council is instrumental in helping the Library share its resources with the nation and the world. One of the purposes of the Council is to fund the fundraising operations for the Library. Abel Buell’s landmark map, known to exist in only seven copies, has extraordinary significance to the historical record of the United States. 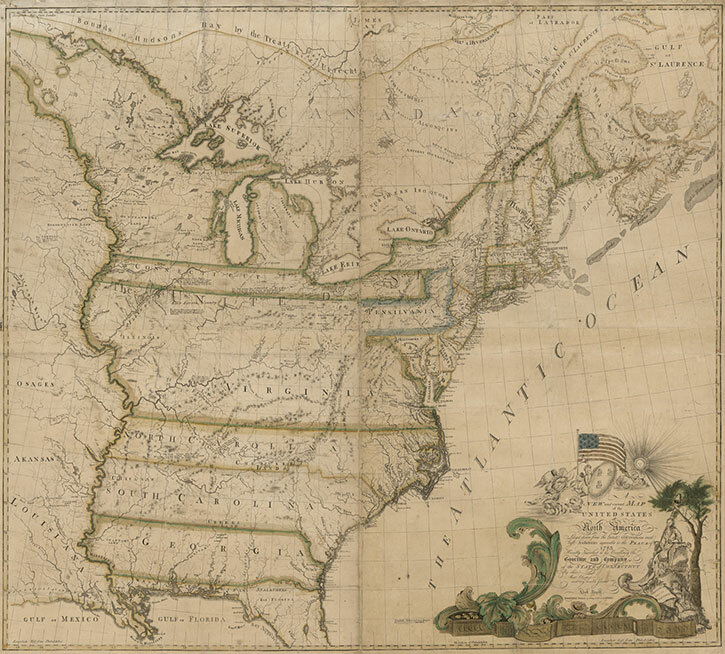 It is the first map of the newly independent United States compiled, printed and published in America by an American. Mr. Rubenstein purchased the map in 2010 and placed it at the Library of Congress so that it can be both publicly displayed and, by means of digital technology, made available for research purposes. Abel Buell (1742–1822), an engraver from Connecticut, produced the New and Correct Map of the United States of North America in March 1784, only six months after American and British representatives signed the Treaty of Paris, in September 1783, which formally concluded the American Revolution and recognized the United States as an independent nation. The Library of Congress National Book Festival is an annual literary event that brings together best-selling authors and thousands of book fans for author talks, panel discussions, book signings and other activities. Since 2001, the National Book Festival has become one of the preeminent literary events in the United States. The festival is funded by private donors and corporate sponsors who share the Library’s commitment to reading and literacy. Since 2010, National Book Festival Board Co-Chairman David Rubenstein has been the festival’s lead benefactor and in 2013 pledged funding for the festival for five more years. The festival was created by Laura Bush and then-Librarian of Congress James H. Billington at the suggestion of Mrs. Bush, who had created the Texas Book Festival. The first National Book Festival was September 8, 2001. Mrs. Bush served as honorary chair of the festival through 2008. President and Mrs. Obama have served as honorary co-chairs from 2009 to the present. Through the generosity of David Rubenstein, the Library of Congress Literacy Awards Program honors organizations that have made outstanding contributions to increasing literacy in the United States or abroad. The awards also encourage the continuing development of innovative methods for combating illiteracy and the wide dissemination of the most effective practices. They are intended to draw public attention to the continuing need for literacy services and to increase awareness of the importance of literacy. By recognizing current achievements, the awards seek to inspire organizations, foundations and other private sector groups to become involved in combating illiteracy. THE DAVID M. RUBENSTEIN PRIZE is awarded to an organization that has made outstanding and measurable contributions in increasing literacy levels and has demonstrated exceptional and sustained depth and breadth in its commitment to the advancement of literacy. The organization will meet the highest standards of excellence in its operations and services. This award may be given to any organization based either inside or outside the United States. THE AMERICAN PRIZE is awarded to an organization that has made a significant and measurable contribution to increasing literacy levels or the national awareness of the importance of literacy. This award may be given to any organization that is based in the United States. THE INTERNATIONAL PRIZE is awarded to an organization or national entity that has made a significant and measurable contribution to increasing literacy levels. This award may be given to any organization that is based in a country outside the United States. Acting Librarian of Congress David Mao and Library of Congress Literacy Awards benefactor David Rubenstein award the 2016 American Prize to Sally Ann Zoll, CEO of United Through Reading, during the Literacy Awards ceremony, February 17, 2016. David Rubenstein meets with children from the Letters About Literature and A Book That Shaped Me contests, September 5, 2015.